This is one of the most continuous sections of shoreline along the Bay Trail. This is a prettier and less developed section of the Bay Trail than our Emeryville to Richmond route. 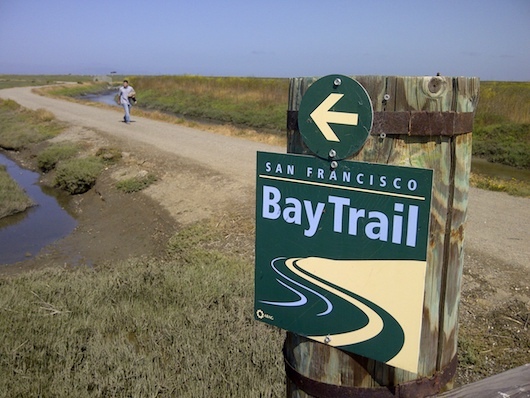 Starting at San Leandro Marina, follow the Bay Trail south, for up to 7 miles to Hayward, at Rt. 92. Of course, the run can be shortened by turning around at any point. There are great views of the water, and salt marshes/sloughs. Most of the trail is right along the shoreline. Mainly unpaved and flat as a pancake! A nice add-on, at the northern end of the trail in Marina Park, is the 1+ mile loop out to Faro Point. One can continue south from Hayward, crossing a bike/pedestrian bridge over Rt. 92, along the Bay Trail, along the Eden Landing Ecological Preserve and into Coyote Hills Regional Park. Or, north toward the airport. Anywhere along trail; North terminus is San Leandro Marina; South Terminus is San Mateo Br.